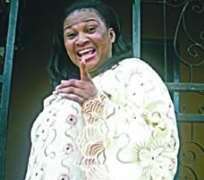 If some top Nollywood actors are asked to recall their most embarrassing moments in moviedom, one of them would definitely mention the day an upcoming movie producer and director, Yinka Sam-Aina, of Xpression Media, Sabo, Yaba, subjected them to unwarranted ridicule. Though an independent producer, Nollywood Reel learnt that Sam-Aina, had invited actors for the shooting of one of his upcoming flicks. It later turned out a ridiculous outing for the Nollywood stars, as they had to beg for food at the film location. Apparently, Sam-Aina, who had earlier told Nollywood Reel in an interview that he would never make sub-standard movies, disappointed the likes of Rachael Oniga, Elder Dejumo Lewis, Jibola Dabo, Femi Branch and ace comedian, Aderupoko, when a proper welfare package was not put in place for them during shooting at a location in Fagba area of Agege a few weeks ago. When Nollywood Reel visited the location, Aderupoko, one of the major characters in the flick, was not only lamenting his disappointment, he also refused to continue with the shooting of the movie if he does not fill his empty stomach. Rather than attend to the hungry actors, Sam Aina continued with his shooting, forgetting that as the host, he ought to have put in place a better welfare package for the artistes. In the same vein, the likes of star actress Rachael Oniga, Jibola Dabo and Dejumo Lewis, also stopped shooting for close to an hour, insisting that they could not continue to work on empty stomachs. Sam Aina, eventually sent his aides to procure a few wraps of Amala and Ewedu from a nearby local canteen, to feed the hungry actors. As if that was not enough, the actors, who devoured the few wraps of Amala like hungry lions, were also lodged, for a few days, in a sub-standard hotel in the vicinity. Speaking when contacted, a popular and senior actor who craved anonymity, said he detests working with upcoming producers and directors of Sam Aina's ilk in Nollywood. “How could an upcoming producer like him ridicule senior actors like that? A situation whereby actors have to beg for food before they were attended to and even lodged in a sub-standard hotel shows that the producer knows nothing about film-making. “That's one of the reasons I don't like working with people of that category in Nollywood,” the actor stated. A foremost actor and observer said that it clearly shows that most independent producers are those shooting movies with less than half a million naira, thereby dragging the name of authentic movie producers in the mud. But Sam-Aina had earlier claimed that he spends not less than N1.5 million on his films.